For many, spring marks a season of fresh air and beautiful blooms. 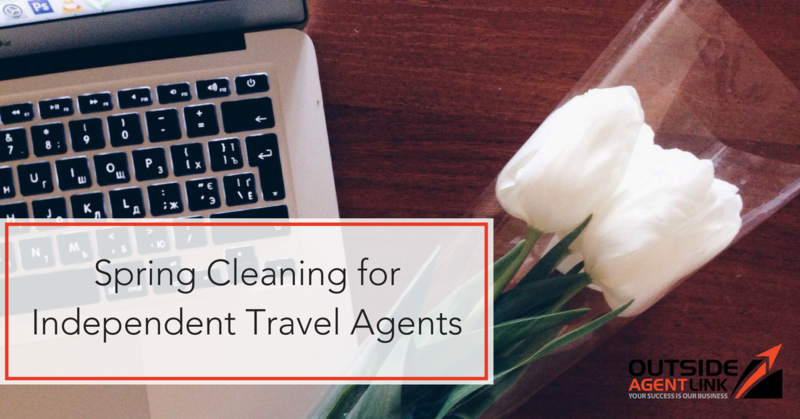 For independent travel agents, it’s the perfect time to do some spring cleaning for your business. Go through your past and current client list. Likely, throughout the past year you’ve interacted with clients through a myriad of methods and have stored their info in a range of places. Comb through all of the client information you’ve compiled through the year and decide if the client is someone that would be great to follow up with in the upcoming weeks or if it’s a client that could be placed in separate file to retain the info, but not to follow up. Once you’ve ran through your client list, gather all of the client info into one neat destination whether that be in a file cabinet, on an organization app or even in excel. Pro tip: offering new promotions or discounts is a great way to reach out to past clients that could potentially be ready to partner with you again for another vacation. As an independent travel agent, you’ve likely found yourself flooded with emails on a daily basis. This can make it difficult to stay on top of everything in your inbox, but this spring, take some time to do some spring cleaning of your inbox. Flag any action items you may have lost track of in the hustle and bustle of everyday life. Delete emails that have no relevancy to you anymore or store them in a separate folder in your email. Print out any important emails and store them in a file folder. Whether it’s through business cards, email signatures, texts or in-person meetings, contact information accumulates quickly especially when you’re an independent travel agent. This spring ensure your contacts are up to date and that contact info is easily accessible. Pro tip: If you don’t like filling up your cell phone with a large contact list, use a Google spreadsheet to organize contact names, numbers, email addresses and any additional info you have. Compile a list of current travel industry trends. Taking some time to refresh yourself on new travel trends will help you stay on top of the best practices and ensure you’re always promoting the most current information to your clients. Pro tip: participating in travel Twitter chats is a great way to stay on top of current travel industry trends. Spring is not only a good time to clean out junk mail and organize your office, it’s also a good time to refresh your thinking and goals. This spring, make it a priority to set new goals for yourself while also making sure you clear out any negative business thoughts you’re still holding on to or unmet goals that you’re beating yourself up over.